Dhemaji will remain cut-off by road for at least over ten days, as, the Border Road Organisation (BRO), which is engaged to restore road link to the district, will need 10 to 15 days more to install a bailey bridge over Samarajan. Road link to a major part of the district is disrupted for the 14 th day today since August 13. Railway link to the district is also snapped since August 13. Meanwhile, work to restore the rail link is going on and it will take a few more days to complete the work, said NF Railway sources here.According Dhemaji Deputy Commissioner Dr P Ashok Babu, the district administration has put up two temporary foot bridges at Samarajan on the NH-52 and at Butikur on the Dhemaji-Dhakuwakhana PWD Road for the benefit of the people.The floodwaters of the Samarajan and Jiadhol-Kumatia had breached the NH-52 at three places. One of the breaches located at Samarajan is around 100 metre in length and the other two on both ends of the Jiadhol-2 Bridge, are comparatively smaller in size. People can cross the Jiadhol breaches on foot now as the floodwater has started receding for the rainless condition during the past three days. 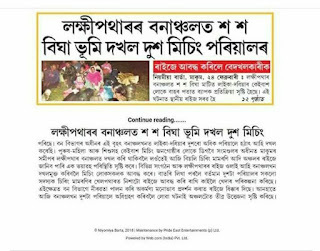 The BRO people are now doing the earth work to fill up the Jiadhol-2 Bridge breaches.It needs mention here that the recent wave of floods affected around 1.6 lakh people of 252 villages in the district. 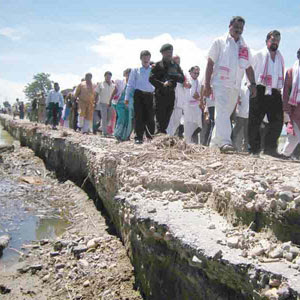 The floodwaters affected vast areas of Dhemaji sub-division and some parts of Jonai sub-division. However, there is no report of outbreak of any communicable disease from any part of the district so far, said the Deputy Commissioner.By this time, floodwaters have started receding gradually in Majuli river island and normalcy is expected to return to the island within the next seven to ten days, said SDO (Civil) of Majuli P Handique.The civil administration of the island held a meeting with the traders’ organisations of the island today with view to maintaining the price line and also the quality of the essential items. The traders are asked to display the price lists of the essential commodities for the knowledge of the customers, said the SDO.A meeting of the Gaon Burhas is also convened tomorrow by the civil administration to make them aware of the need to maintain a live communication with the civil administration on issues like food poisoning, outbreak of communicable diseases etc. It needs mention here that some islanders fell ill recently after taking maah prasad at a religious function.